Tennis Elbow | Dora Jackson, R.M.T. 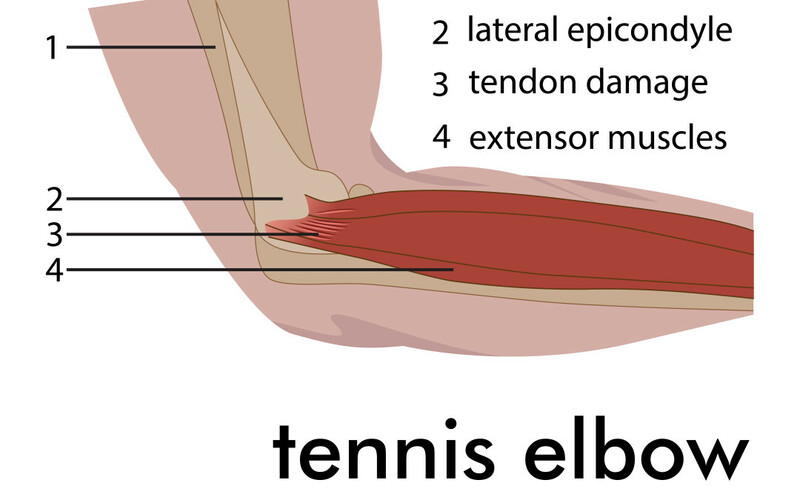 Tennis elbow (aka Lateral Epicondylitis) is inflammation and pain on the outer part of the elbow. It happens when you damage the tendons that connect the muscles of your forearm to your elbow, usually due to overuse. The pain may spread down your arm to your wrist and it may hurt to do very simple things like turn a key or open a door. It’s common in tennis players, but most people get it from other activities that work the same muscles, such as gardening, painting, or using a screwdriver. It is often the result of using equipment that is the wrong size or using it the wrong way. For example, a tennis racquet with a grip too large for your hand can lead to tendon damage. * Apply ice or cold packs for 10 to 15 minutes at a time, up to 2 times an hour, for the first 3 days. Keep using ice as long as it helps. * Take over-the-counter pain relievers such as ibuprofen or acetaminophen if you need them. * Wear a “counterforce” brace when you need to grasp or twist something. This is a strap around your forearm placed about an inch below your elbow. It eases the pressure on the tendon and spreads force throughout your arm. After the pain eases, you can return to your activity but take it slow and stop if it hurts. * Take lessons or ask a trainer or professional to check the way you are doing your activity. If the way you use a tool is the problem, try switching hands or changing your grip. Make sure you are using the right equipment for your size and strength. * Always take time to warm up before and stretch after you exercise. * After the activity the tendon may be aggravated, so apply ice to prevent pain and decrease swelling. Listen to your body’s signals and rest when you need to or you’ll risk a recurrence. You will probably feel better in a few weeks, but it may take 6 to 12 months for the tendon to heal so BE PATIENT and stick with your treatment. It will be worth it!! NOTE: All information is intended for educational purposes only. If you have a particular concern, please consult your qualified health care provider. My home office is located in Toronto Ontario Canada at 246 Garden Avenue M6R1J3 in the heart of Roncesvalles Village just east of High Park. Please refer to the map on the Contact page for details and feel free to contact me by email at dorajacksonrmt@gmail.com or phone at 416-560-3469 with any questions. Website developed for Dora by Friendly Geek Consulting . All content copyright 2015 by Dora Jackson, unless otherwise noted.